A 'small business' in Oklahoma recently came to my attention when a friend called to ask me if this small business was part of the Trojan Triangle system. The Republican Party-backed candidate for Governor, Rep. Mary Fallin (R-OK) got a $3 million earmark for this so-called small business in 2008. To a member of Congress, that's peanuts but to the general public, that's a lot of money so we formed a 'Citizen-Citizen Partnership' to investigate. What follows are the results of that investigation. The name of the small business is Wave Technologies, Inc. It is located in the Mid-America Business Park in Shawnee, Oklahoma. 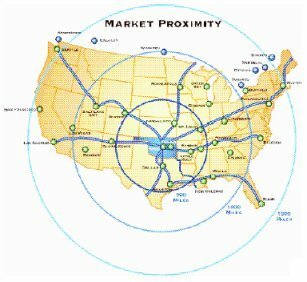 The Oklahoma City area is a major transportation hub and is directly on the path for one of the trans-continental international corridor system of smart-highways that originates in Texas. 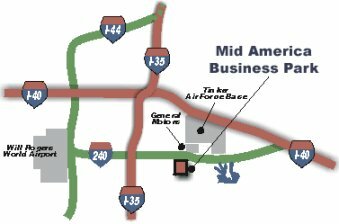 The Mid-America Business Park is listed on page 22 of the Foreign Trade Zone - No. 106. Mid America Business Park is a "Hubzone". Hubzone is a designation given by the Small Business Administration (SBA) to what they call "Historically Underutilized Business Zone". The Hubzone program was included in the 1997 SBA Reauthorization Act. This program was only one of many "community" programs implemented for the Clinton-Gore redesign of the American government and the redesign of the American way of life to more closely parallel the Communist countries of the Soviet Union and China. All of the Clinton-Gore "community" programs were for what is collectively termed the "New Economy". When a small business becomes a certified SBA small business and they locate in a Hubzone, that small business can get a designations that will give advantages to to it in terms of loans, assistance and government contracts. You can recognize the businesses that have that designation because they'll usually refer to the classification on their website. For example SBA 8(a) is one such designation. See HUBZone Empowerment Contracting Program. Wave Technologies is an SBA 8(a) business with two locations. One of them is in Shawnee, OK located in the Mid-America Business Park. The other is in Herndon Virginia. Another location in Dayton, Ohio was listed but I could find no information on it. The following is a picture of the Wave Technologies office in Shawnee, OK. There are two businesses in the building. One of the businesses is a hair dresser and is clearly marked. Wave Technologies is not marked except for the mailbox. More pictures can be viewed HERE. Inquiries were made of the neighboring businesses. They said that there used to be one man who came into the office occasionally but they haven't seen him in a while. According to the terms of the Hubzone disadvantaged status for government contracting preferences, at least 35% of the employees must live in the zone. A report that included the chart to the right was found on a political lobbying website named 'US Innovation' that was linked to an organization named ASTRA - "The Alliance for Science & Technology Research in America". Do read the fine print at the bottom. The earmark to Wave Technologies was $3 million. Given the amount reported and the note, it implies that Wave Technologies is a GOCO. The inclusion of Wave Technologies on the above list for Research and Development funding, plus a number of other clues led me to believe that Wave Technologies might be connected to the Trojan Triangle system that I've been researching for the last couple of months. But the connection to the University of Oklahoma and the Oklahoma Department of Commerce is relatively recent and weak but there are indications that they will become part of the Trojan Triangle system in the near future. At this point however, Wave Technologies is just part of the parasitic 'Small Business' government contracting system that operates like a leach on warm body. I haven't given a name to that system yet, but it is yet another aspect of the "New Economy" under the heading of Economic Development. Wave Technologies, Inc began in Rural North Carolina as a Telecommunication and Internet Service provider; it later expanded into High Speed Digital Documentation and Data Storage Systems. In 2001 after the 9/11 attacks Wave Technologies, began to include State and Federal Government Contracting into our Commercial activities. As we began our transition, our initial government contracts were for IT work for county and State Government and Advanced Concept Technology Demonstrations for US Marine Corps. As a person who spent 20 years in the IT business when I read that paragraph, my professional opinion is that 9/11 was a non sequitur with their business model and their actions following. The only way they could be related is if there was a covert plan in effect and 9/11 was the starting gun. I believe the later is true. Lisa Otipoby Whetzel, our Chief Executive Officer (CEO), is a member of the Comanche Nation. business. Our initial business base was commercial telecommunications. Agency (DTRA), work that continues to this day. North Carolina to Ponca City, Oklahoma. 2003 was a profitable year for WTI. OK and a satellite office in Chantilly, VA.
projections for 2004 revenues are $7,500,000 or 188% growth. WTI's future is very exciting. 3524 and 3548 routers, and over 13,000 feet of CAT 5e (enhanced) cable and fiber optic cabling. The systems is up and operating and certified at 100 Mbits. (Note: USA Spending's total is 52,348,555. The $2.00 difference between the total my spreadsheet produced and the total produced by USA Spending is probably due to a rounding error not apparent by the display of whole dollars. I started this research thinking that the Mid-Atlantic Business Park in Oklahoma might be a Trojan Triangle. I think it will be some day. They are working on it. But in doing that research, I found something that is far more troubling - actually I've found a lot of things that are extremely troubling. The company I started researching was a small, rural telcomm established to provide Internet services - but that also had a contract to digitally image medical records in North Carolina. 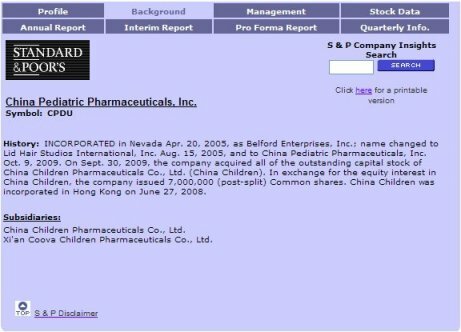 I'm ending this research finding the rat's nest of connections that include a Chinese children's pharmaceutical company associated with a hair salon associated with a defense company specializing in sensors for surveillance, monitoring and tracking. And Robert Rubin's name (don't know if it's the Goldman Sachs Robert Rubin) appears in an SEC filing with the Hair Salon - with $36k but with 9,000,000 outstanding shares. The corporation, Hadron that bought Wave Technologies hired Ken Alibek. Alibek had been the Deputy Director of Biopreparat, the Soviet Union's biological warfare program before being invited into our country in a program similar to Operation Paperclip. The legislation that brought Alibek to this country can be viewed in a post I did called "Invitation to Terror". And best for last, Alibek was doing research on anthrax vaccines prior to 9/11/2001. And they already had funding to do this research when the first anthrax attack occurred. (Note: Hadron name chg to Analex in 2002). In fact, Hadron had received several grants for Anthrax research a few months apart in the months preceding September 2001. (Note: Alibek worked for Hadron-Analex subsidiary Advanced Biosystems - but they did a name change to AFG BioSolutions). Something very curious and "coincidental" that I noticed when looking at this was that there seemed to be a deliberate selection of victims that is similar to how analysts select test cases for a systems test. There was an old woman in CT. A baby in New York. And a hospital worker at the Ears, Nose and Throat Hospital in Manhattan. The coincidence is that on September 11, 2001, the Public Health Department of Connecticut implemented the "Early Aberration Reporting System" (EARS) in response to the attack. This was reported in an article published by the CDC. It was also reported in a paper published on a website called Red Orbit but they said the system was called HASS and that it was developed and implemented on September 11. It's not possible to develop and implement a system on the same day but the article is professionally written and is in conflict with an article published in what I assume is a medical journal named Morbidity and Mortality Reports that says that EARS was developed by the CDC. What happened on 9/11 was a non sequitur to a biological warfare attack. I have no doubt that the CDC wrote the EARS system and for it to have been implemented on 9/11 linked to the alleged airplanes flying into buildings combined with the ABC News interview with Jerome Hauer, biological warfare expert on 9/11 pointing to Osama Bin has a malodorous aroma to it. Anyway, it got too complicated with all the connections and too weird so I'm stopping here. October 2002 Wave Technologies incorporated in Oklahoma. Howard C. Whetzel, incorporator.